For years, there had been deep concern among the people of Columbus, Ohio. If you wanted a selection of steaks and were in the area of downtown between Mitchell’s Steakhouse on Third Street and Hyde Park on the High Street cap, there was nowhere to go! Sure, you could get a good steak at Flatiron Bar and Diner as one of the items on its Cajun-influenced menu, but if you wanted the full steakhouse experience, you were totally out of luck. Fortunately, Jeff Ruby’s Steakhouse ventured north from its Cincinnati roots and appeared on Nationwide Boulevard to address the disturbing steakhouse desert that existed in the north downtown area. Now we have three high-end steakhouses in the space of a few walkable blocks. Last night the Bahamians joined Kish and me as we checked out Columbus’ newest steakhouse. We found a lavishly decorated place — the chandeliers alone might require us to don sunglasses for the next visit — that featured live music in the bar and a busy dining room. The wait staff was extremely professional and helpful, and featured both our waiter and a sommelier who advised on the many choices on the wine list. After we indicated our interest in Italian wines and ordered a reasonably priced bottle of Amarone, he stopped by at the end of the meal and offered us a free pour of another Italian wine on the list. It’s the kind of treatment that helps to bring people back. The food is on the pricey side for Columbus, Ohio, but it was good, too. 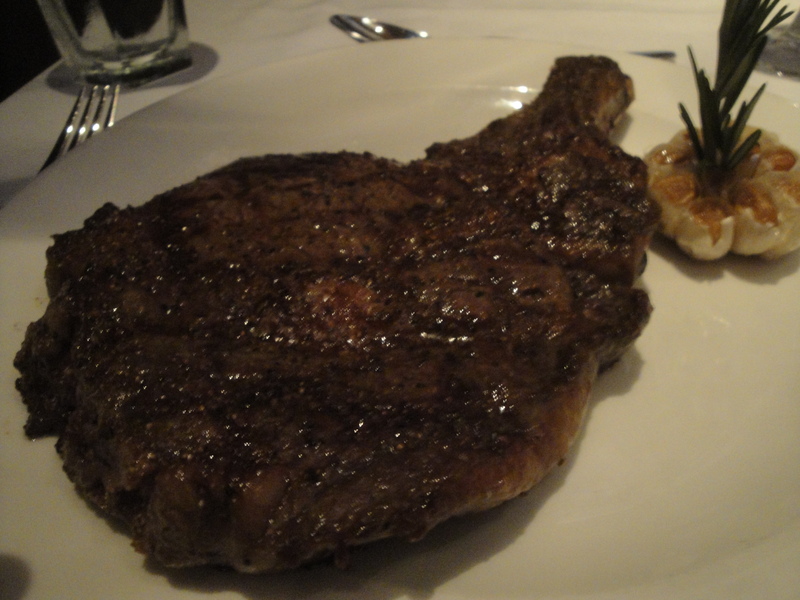 I got the ribeye, which was prepared with a very nice char and was succulent. For sides we went with some tasty creamed spinach and a kind of loaded potato gratin (the others in the party also tried the green beans, which I studiously avoided), and the four of us split a creamy piece of cheesecake and a chocolate cream puff for dessert. It was a fine meal from stem to stern. How many steakhouses does downtown Columbus need? As far as I’m concerned, there just can’t be too many. I’m glad Jeff Ruby’s has joined the club. Last weekend Kish and I visited a new steakhouse in town. I was looking forward to the visit, because I was hungry and eager to tuck in to a well-prepared piece of beef. That night I had a special hankering for one of my favorite cuts of meat: prime rib, medium rare. Alas, when we arrived and I had the chance to carefully review the menu, I was disappointed to learn that prime rib wasn’t among the offerings. Eh? A self-proclaimed steakhouse that doesn’t offer prime rib? Unfortunately, it’s becoming an increasingly common occurrence. Most non-vegetarian, American-style restaurants have filets and ribeyes and New York strips on the menu. Most steakhouses will offer different sizes of those staples, and typically a porterhouse, a Kansas City strip, or a hangar steak option, as well as lamb chops. But prime rib, which was a common menu option in restaurants of days gone by, seems to have hit the cutting room floor. It’s getting to the point that if you want to get some prime rib these days, you have to go to a medieval-themed eatery where suits of armor line the walls and the waitresses wear costumes with bodices. Tastes change, sure, but nevertheless I’m mystified by this development. I just don’t get the filet phenomenon. Filets are too soft and mushy for my tastes. They’re like the non-steak steak, eaten by weak-kneed, vegetarian-wannabe steak apologists. The heck with that! I want a cut of beef with some texture to it, that provides some resistance when you chew it and isn’t described as being like butter in your mouth. Sometimes, only a prime rib, medium rare, thick and juicy and ready to be carved into bite-sized morsels by an oversized steak knife, with a side of horseradish, will really do the trick. But good luck finding it these days! That doesn’t mean I’ll stop looking. Last night, the Carroll County Cousin, Kish, and I went to the newest restaurant in our neighborhood — The Barn at Rocky Fork Creek. You’ll find it at the intersection of Route 62 and Morse Road, on the border between New Albany and Gahanna. 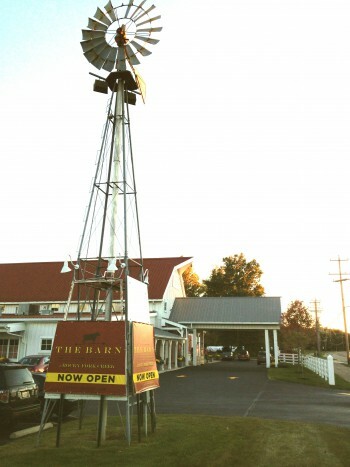 The Barn is located in a huge, barn-like structure that formerly was a Hoggy’s restaurant. Hoggy’s, a barbecue joint, featured a large antique tractor hanging from the ceiling that I always assumed was designed to encourage table turnover by incentivizing diners to wolf down their food and get away from the presumed kill zone if the tractor ever were to fall. Thankfully, The Barn has removed the Tractor of Damocles from the ceiling. However, The Barn fortunately has kept the meatcentric orientation of the old Hoggy’s, with a few steps in the upscale direction. It bills itself as a destination steakhouse, but it’s not the kind where the waiters wear black jackets. Instead, it has a kind of rustic flair, with the servers sporting gingham shirts and the menu featuring some smokehouse and barbecue options as well as a fully array of steaks, seafood, salads, and sides. I had a shrimp cocktail and the “king’s cut” of prime rib — a full 16 ounces — because sometimes only a red slab of beef with flavorful fat around the edges will do. The shrimp cocktail was packed with shrimp and a sinus-clearing, horseradish-heavy cocktail sauce that let you know this restaurant isn’t afraid to offer bold flavors. The prime rib was great — a large, juicy, perfectly cooked cut that I savored bite by bite. 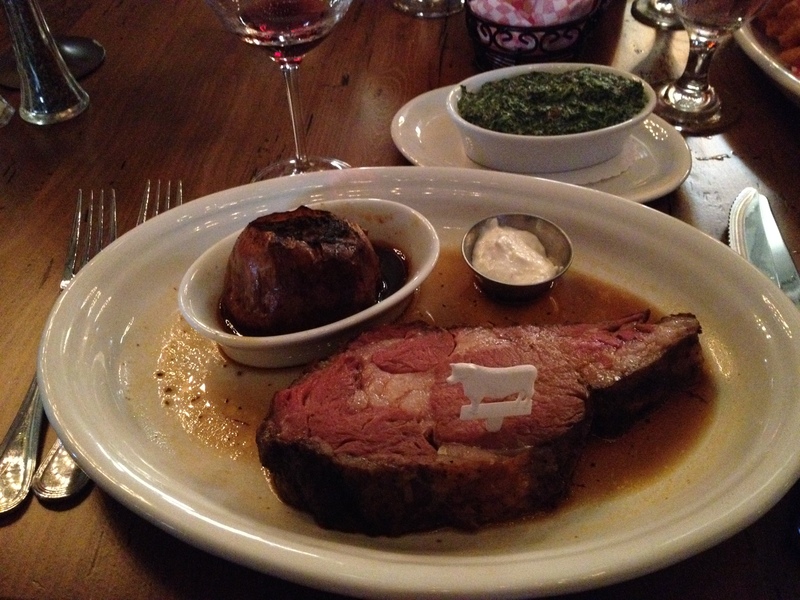 The prime rib is served with a large baked onion, and we got some very tasty creamed spinach for the table to complete a classic, old-line steakhouse meal. The Barn just opened last weekend, and it’s still got some kinks to work out. The place was packed when we were there, and it took too long for our food to arrive — which was a source of some concern because Kish and the Cousin were on their way to a show. I’m hoping they iron out the kinks, because the food was quite good and we really need more restaurants — especially hearty, beef-oriented ones — in this neck of the woods. If you come to New York City, you have to go to a steak house. In Gotham, they just know how to do steak. Sparks is one of the premier steak joints, and that’s where I am tonight. 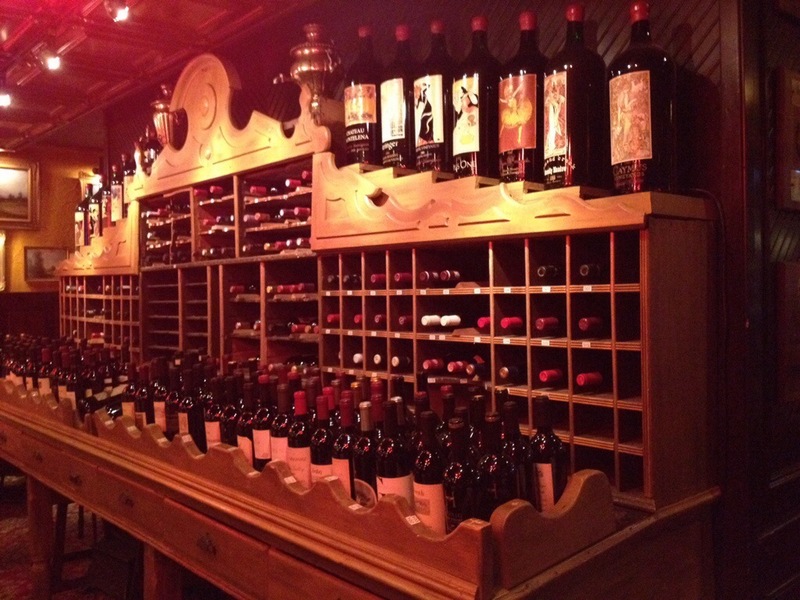 Oh, and they’ve got a good wine list, too. A quick trip up to Akron today. Aunt Corinne and Uncle Mack were in town, so Mom, Kish, and I went up to visit with them and Aunt Bebe. It was great to see everyone and to check out “The Buckeye Room” at “Buckeye Bebe”‘s pad. 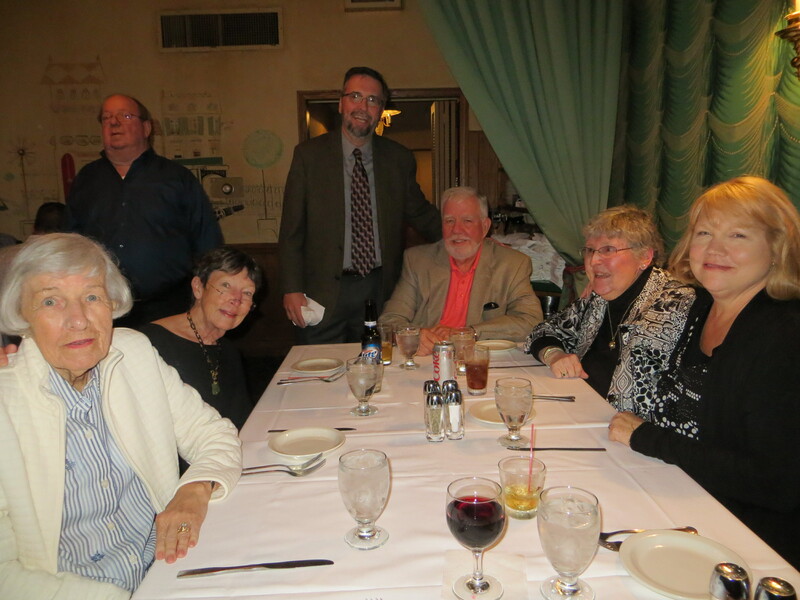 The quick jaunt was properly capped off by dinner at the Diamond Grille, which — as any regular reader of this blog knows — is a fabulous steakhouse and the source of many fond memories for Uncle Mack. A few oysters, a glass of wine, some great conversation, and a perfectly cooked medium rare Porterhouse steak as big as a stop sign later, we were back in the car and rolling down I-71 to Columbus, letting the digestive juices do their work. Last night I went to dinner with friends and was delighted to find that my host had selected a steakhouse for our meal. On some occasions, after a hard day’s work, only steak will truly satisfy the taste buds. The only thing that was unusual about the place was the music selection. It was distinctly on the new age side, where most steakhouses go for the vintage Frank Sinatra/Tony Bennett/big band background music soundtrack. XO’s dreamy tune choices made me feel like I’d be given a massage and a glass of herbal tea after the meal. Who really cares about music, though, when you are getting ready to tear into a thick, juicy, well-prepared steak washed down with a fine dry red wine? 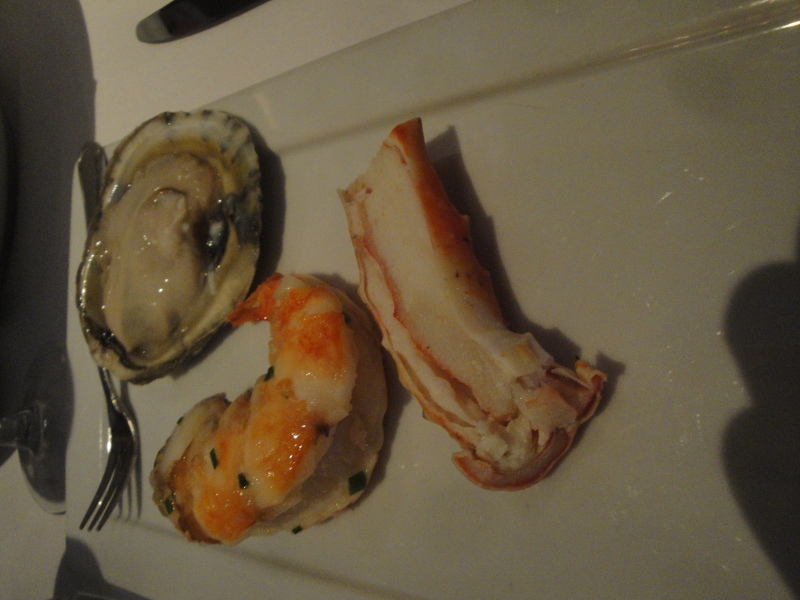 We had a seafood platter appetizer, which featured excellent oysters, king crab legs, huge tiger prawns, and a lobster salad. For my meal I ordered the bone-in ribeye steak, cooked medium rare. It was succulent, and I gleefully sliced it up and gobbled up every bite. The meal was brought to an appropriate close with some apple cobbler. When we departed after a very enjoyable evening, I pointed my well-nourished gut in the direction of our destination and left a happy man.